Good news, we're almost through the week! It's been a busy one for me with work, which usually translates into me snacking throughout the day and eating at my desk rather than taking time to make myself a healthy lunch. Anyone else do that?! When I worked in the Capital I always ate lunch at my desk while doing a million other things at the same time, so it's a bad habit I can't seem to kick. I find that if I don't step away from the computer and eat something other than chips or pretzels for lunch, my energy level plummets and I start getting cross-eyed. It's no good. Anyway, on to the real point of this post which is a super easy greek salad you can have for lunch without feeling bad! I love this salad. 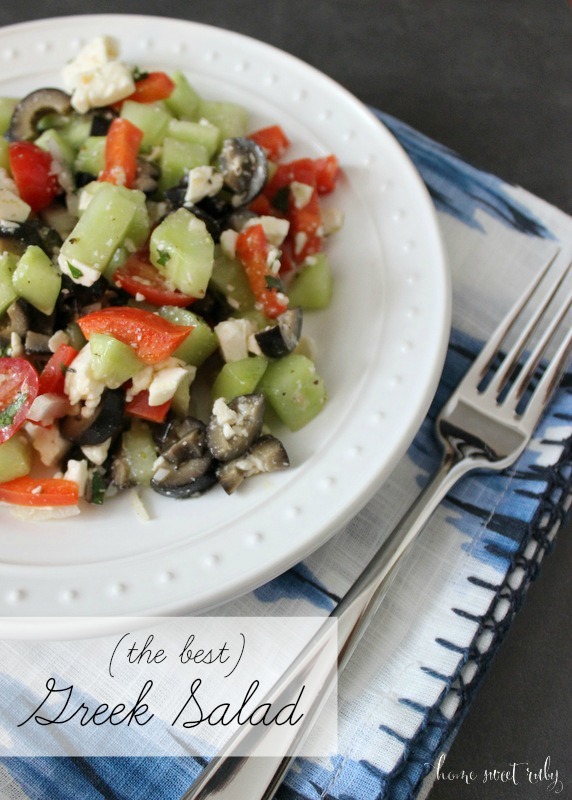 It's delicious and gives you a bunch of veggies topped with feta. I mean, what could be better? You can even bring some pita bread and use it as a dip. Storing it in a mason jar also makes it so easy to grab and go for lunch! Whisk your dressing ingredients in a small mixing bowl. Add your chopped vegetables and toss. Refrigerate for 20 minutes before serving. So easy! What's your go-to meal for a quick and healthy lunch? I'm always looking for more ideas! Looks delicious! And I love the idea of putting it in the mason jar! SO GOOD. This is one of my favorites. I'm so bad about eating at my desk and snacking all day... :( I try to go to the gym during my actual lunch break so I usually eat at my desk before or after but I should be eating healthier. This sounds amazing though. I absolutely love feta and red wine vinegar so I'm going to have to try this out! Love all things Greek. I make something a lot like this but the main ingredient is Garbanzo beans/chick peas, plus a vinaigrette and yummy Greek goodness like feta and definitely tomatoes. I've made that dressing before and it's delicious! We make a similar salad but Theo doesn't like olives so we have to nix those! Ohh I am definitely going to make this-- sans the tomato and probably the cheese, but I LOVE just using cucumbers instead of lettuce, my husband always laughs at me because I usually leave half of the lettuce on my plate whenever I have salads!